A Progressive Web Apps is a web application which takes advantage of modern browser features and can be added to your homescreen, behaving just like a native application. In this tutorial we're going to show you everything you need to know about PWAs, step by step, with practical examples and a demo app. To not start from scratch, we are going to use the selfie app we made recently, and make it progressive. Responsive - Fit any form factor: desktop, mobile, tablet, or whatever is next. Connectivity-independent - Enhanced with service workers to work offline or on low quality networks. App-like - Feel like an app to the user with app-style interactions and navigation because they’re built on the app shell model. Following these guidelines will ensure that your app works well not only when viewed in the browser, but also when started separately via a home screen shortcut. You may find the wording Google has chosen rather confusing, but don't worry, we will explain the rules one by one later in the tutorial. All of the aforementioned technologies wrap HTML apps and package them into executable files, be it an .apk, .exe or anything else, which then have to be downloaded from the respective app store and installed on the user's device. PWAs don't require installation and aren't available (yet) in Google Play or the iTunes App store. To download a PWA you need to simply visit it's website and then save it to the home screen as a shortcut. Developing and maintaining separate iOS and Android versions is no longer an issue, but browser support needs to be taken into consideration. Most progressive web apps work with native APIs and service workers, technologies that deal with sensitive data and need to be handled with caution. That's why every PWA has to be served through a HTTPS connection. If you don't have access to a server with a SSL certificate, the easiest way run projects in a secure environment is via GitHub Pages or a similar service. Any GitHub repository can be hosted directly over HTTPS, and both GitHub and GitHub Pages are free for public repos. This is where we've chosen to host our demo: https://tutorialzine.github.io/pwa-photobooth/. For simple testing on a local server, you can also try Ngrok. Its a tiny tool that allows you to tunnel any currently running localhost to a secure public URL. Ngrok is free and available for Windows, Mac, and Linux. Essentially, what this means is that PWAs should use web technologies that are widely supported and work equally well on as many browsers as possible. As we all know, in the world of web development this is close to impossible, but still there are things we can do to cover a larger user base. For example, in our PhotoBooth app we use the getUserMedia() API for accessing the hardware camera on a device. Its support in different browsers is quite inconsistent - Safari doesn't support it at all, the browsers that do support it need prefixes and differ in usage. Fallbacks and polyfills should be provided where possible. The same principles go for the CSS and HTML code. The app should look nice on all devices, no matter their screen size. Our app has a fairly simple UI so we've used only a couple of media queries to control font-size, paddings, margins, etc. Don't be afraid to use CSS libraries and frameworks such as Bootstrap, as they make it really easy to form grids, and deal with typography and general responsiveness. This is an important one. Using service workers allows your app to work even when there is no internet connection available. Some apps can be cached only partially: UI is cached and available offline, dynamic content still needs access to a server. This is an oversimplified usage of Service Workers, use with caution in commercial projects. // Install the service worker. // The cache will fail if any of these resources can't be saved. // Path is relative to the origin, not the app directory. // Define what happens when a resource is requested. // For our app we do a Cache-first approach. // Fallback to network if resource not stored in cache. Then we need to link that service worker to our HTML. // Path is relative to the origin, not project root. Right now Service Workers are supported in Chrome, Firefox and Opera. Safari and Edge are also working towards adopting them, and we hope that in the future they will be available in every browser. 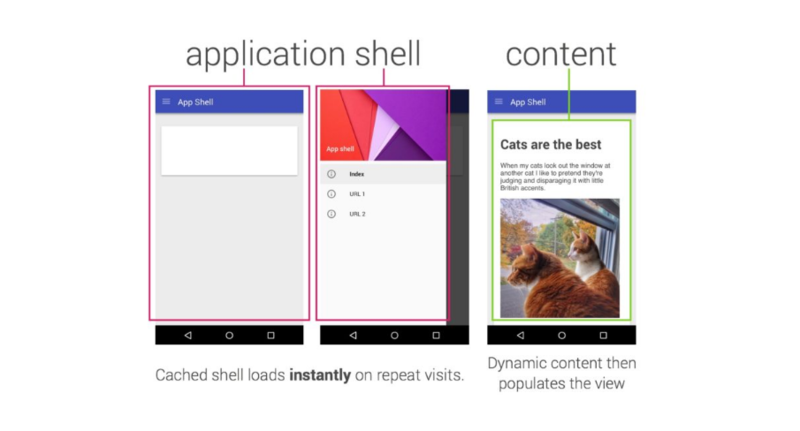 When building PWAs, it's recommended to follow a design concept called app-shell architecture. It sounds very complicated but essentially boils down to this: the app is separated into two major components: the shell and the content. The shell contains all the static UI elements such as a header, menus, drawers, etc. When we cache an app, the shell should always be saved on the device, because we want it to be available at all times. That way when a user with no internet connection opens the app, they won't see an empty screen or a running dinosaur - they will see the cached app interface and an appropriate error message. The content resides within the shell. It can also be cached but it isn't necessary to do so as content is usually dynamic, changes frequently and can be different on every single page load. Once cached, our PWA will always load from the local storage. However, if we change the service worker sw.js in any way, on the next page load the new version will be downloaded and installed. Using service worker updates we can re-download resources, delete old cache, or completely change the service worker logic. You can learn more about the SW Update process from this Google Developers article - here. By adding a Web Manifest to our app we can provide various information about it and change the way it is displayed on people's devices. It allows apps to be saved to the home screen with a custom icon, to be started in a separate browser window, and a lot of other cool stuff. Most of the properties are self explanatory so we will cover only the more important ones. To see the full Web manifest format and all the available fields go here. Shortname - This is the name our app will have when saved to the home screen. Icons - Array of icons with different resolutions. Display - Defines how the app will be opened. We've chosen standalone so when started our photo booth will appear in a full-screen window without any browser navigation or menus. It will also be seen as a separate app in multitasking. Push notifications aren't limited to native apps any more. Thanks to service workers and the Push API, web applications can also send messages to the Android notification bar. Not all apps will benefit from having this feature, but when used properly notifications can really help engage users. Google Developers, Push Notifications: Timely, Relevant, and Precise - here. Google Developers, Push Notifications on the Open Web - here. MDN, Using the Push API - here. Push.js, Library that provides a cleaner API for handling push notifications - here. By default any website can be manually saved to the home screen using the Add to Home Screen button from the Chrome browser menu. However, it might be rather difficult to make users "install" our app this way, since most people don't know about that feature at all. There is a valid Web Manifest. There is a valid Service Worker installed. The app is served over HTTPS. The entire installation process of our app is in this simple prompt. The install happens instantly, and once saved the PhotoBooth will be available to launch from a home screen icon, behaving exactly like a native app. Anyone with a web browser has access to PWA apps and they can be shared simply via their URL. No third party tools are required for finding or installing them. If an app runs in standalone mode, it's also advisable to add in-app share buttons, since the browser address bar and menus aren't visible. If you want to find more PWAs to play with, go to pwa.rocks. They offer a nice collection of games and useful tools, showcasing the great power of Progressive Web Apps. Great tutorial. You can read more about all benefits of using PWA in this article: https://www.digitalauthority.me/insights/the-ultimate-guide-to-progressive-web-apps-24-12-2017.